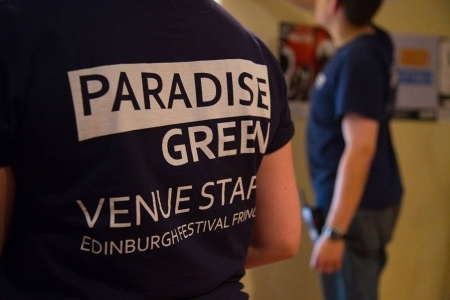 Paradise Green aims to be a fun place to volunteer as well as providing a professional fringe venue. The best testimony we have for this are the volunteers that work for us. Many of these volunteers return year after year! Here is some of the feedback from previous years. I joined Paradise Green to gain more technical experience at venues and also to visit the Fringe. I was offered management roles due to previous experience with my university theatre society. I loved the responsibility of leading teams at Paradise, and learning how to manage people on shifts. Paradise Green gave me a lot more experience that’s beneficial to my society work, as we build and run every bit of the venue. You're given the opportunity to literally do everything - one day I'd be rigging lighting fixtures and the next I'd be leading a team of 5 technicians. It's one of the few jobs I've had where on my last day everyone was talking about next year and asking when applications reopened. I was part of my Musical Theatre society at University who were going to fringe. I hadn’t heard much about it before so I did do a bit of research and found out about Paradise Green.Two years later, I have been a House Manager, an Office Manager and I’ve worked in the Front of House team. It’s just got to be said that Paradise Green is a wonderful company to work with. Being a smaller venue, you definitely get a good sense of community. The half day shifts and one day off a week mean you get to see shows whilst you’re there - I managed to see 52 last year! I had lots of fun and learnt so much being able to take on different roles and meet talented and driven people. Fringe at Paradise Green is honestly the highlight of my year. I applied for the 2016 Fringe at Paradise Green and have never looked back. Over my two years at Paradise I've had both technical and front of house roles and helped demolish the theatre at the end of the Fringe. I keep coming back because the combination of free show tickets, food and accommodation, coupled with it being the most sociable company I've ever worked for, make it one of the best ways to experience the party that is the Edinburgh Fringe! I have volunteered at Paradise Green the last 2 years, as Front of House and Tech in my first year and I then trained as a House Manager in my second year. I have loved my time at Paradise Green; it's a very rewarding kind of hard work, made all the better by the fantastic atmosphere created by the rest of the volunteers and the Fringe itself. I first heard about Paradise Green whilst at Leeds University Union’s Backstage Society and I volunteered for 3 weeks during the 2016 fringe. I started off by spending a week as a show operator before jumping straight into technical management shifts the following week due to my past experience in Leeds. Following this I stayed around for the deconstruction of the venues, during which I also spent some time in the kitchen providing food for our volunteers . Spending time at Paradise Green is spending time doing what you enjoy, with like-minded people (whom, if they aren’t already, will likely become good friends). 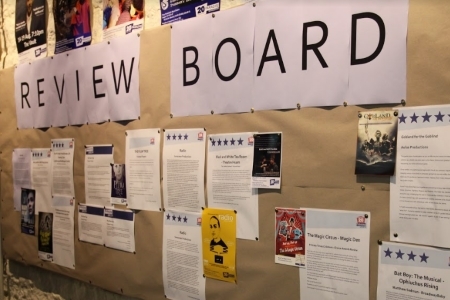 The venue has a relaxed and enjoyable atmosphere and aims to be the best success it can be in both providing an excellent service to the performing companies and an excellent experience for volunteers. It is also by far the best way I have found to experience the Edinburgh Fringe Festival. I found out about Paradise Green through a friend who had worked there the year before. I’ve worked in live music venues and bars and was looking for a holiday where I could meet interesting people and see interesting shows. Who doesn’t love a fringe festival?! In exchange for an 8 hour shift each day in the snack bar, kitchen or box office, PG looked after everything including hostel style accommodation and delicious food. In my three weeks at PG, I made some great friends, saw some fantastic shows and had my fill of bacon sandwiches! 10/10 would do it again. Unbelievably amazing accommodation -- nicer than my house! Comparative luxury to a student from Manchester! I did get a chance to do a bit of everything, so that was good. I really enjoyed my tech shifts. It was all too great, I thoroughly enjoyed each and every shift! It was great that I was given work that matched my technical level, although at times I did feel a touch out of my depth (but then everyone has to start somewhere!). When I mentioned this however, everyone was accommodating and helpful without being judgemental, which was great. I would be very happy to come next year! Very easy to fit in despite it being my first year and everyone was really welcoming.